WICHITA, Kan. — Jordan Poole stood near his locker, drenched in water, reaching for his cell phone. Michigan basketball's boisterous freshman from Milwaukee hit the power button and saw 394 text messages suddenly appear. Minutes later and without warning, that number jumped to 532. "This is not OK," Poole laughed. "My teacher texted me. I made it." 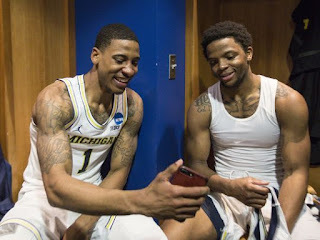 Poole, the man of the hour who still hasn't found a shot he didn't like, will wear the tag of Michigan basketball hero for the rest of his life after his nearly 30-foot buzzer-beater pushed the Wolverines past Houston on Saturday and into the Sweet 16 with a 64-63 victory in the second round of the NCAA tournament. Michigan (30-7) will play the winner of North Carolina/Texas A&M in the West Region semifinals Thursday at the Staples Center in Los Angeles. Known by his teammates as the most energetic and talkative player on the roster, Poole might need more time to answer all those texts. Michigan head coach John Beilein hugs his wife Kathleen Beilein after defeating Houston 64-63 in second round of the NCAA tournament at INTRUST Bank Arena in Wichita, Kan., Saturday, March 17, 2018. Though he was positive he'd be soaking up every minute of it. "He's never going to shut up now," Michigan center Moritz Wagner said with a smile after embracing Poole with a bear hug. After struggling to hit anything all night long, the Wolverines went to an old favorite in the exact right situation. In fact, the play U-M ran with 3.6 seconds left was the same one it used to beat Maryland near the buzzer earlier this season. 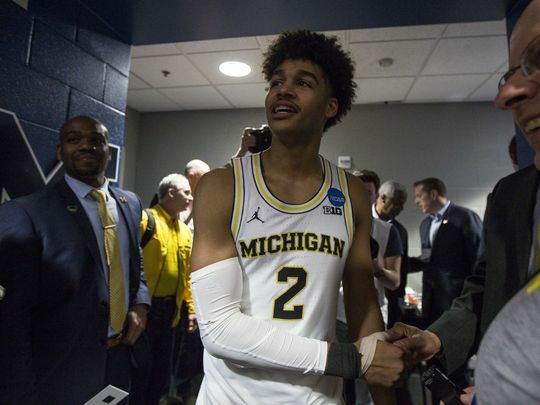 Isaiah Livers, a former pitcher, threw a pass to Muhammad-Ali Abdur-Rahkman, a former high school wide receiver and Michigan's best driver to the basket. Abdur-Rahkman's first instinct was to get as close to the basket as possible. Against Maryland, it worked as he was fouled on his way to the rim. On Saturday in Wichita, he took two dribbles to his left and heard his loudest teammate screaming his name on the right wing. Abdur-Rahkman to Poole. Poole at the buzzer. "He just (yelled) 'Hamm,' and I looked up and saw he was open," said Abdur-Rahkman, citing Poole's nickname for him. "I had 100 percent confidence he was going to knock it down." It's a play Michigan practices every three or four days. Zavier Simpson said the name for it was "Indiana." Livers said it was called "Tennessee." Abdur-Rahkman made sure reporters knew that coach John Beilein changes the name of it often. In fact, there are several different variations of the play, as Beilein puts his best baseball passer (Livers) on the baseline. With Charles Matthews and Duncan Robinson fouled out, Beilein inserted Ibi Watson to help set screens for Poole and Abdur-Rahkman. The ball goes to Abdur-Rahkman and shooters roll with him in search of the cleanest look at the basket possible. He doesn't run it all the time. But he's 2-for-2 this season. 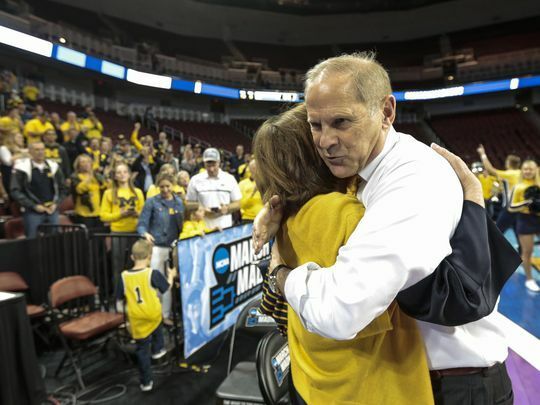 "I'm a little astonished with what just happened," Beilein said. "Jordan's growing every day. Growing in the right direction. He's a heck of a kid and it's going to be fun to watch him over the next couple years." The stage was greater, of course, but Poole believes Saturday's moment was another night at the office. During a scrimmage U-M allowed reporters to watch last week, nine days before Saturday's game, Poole canned deep buzzer-beaters at the end of the first and second halves. The second was a game-winner. Never bashful and always a showman, Poole looked toward empty seats in the Crisler Center with a celebration no one saw. On Saturday, he sprinted up and down the floor as the world watched. "I was shooting (well) in warmups, I hit a 3 earlier in the game and, at that point, it was just repetition," Poole said. "It didn't feel bad. Let's just say that." For Michigan, the entire scenario looked incredibly unlikely just seconds earlier as Abdur-Rahkman missed a runner in the lane that could've tied the game with 3.9 seconds to play. The Wolverines then fouled Houston forward Devin Davis, who had hit six free throws down the stretch. But Davis walked to the other end and missed both. Wagner collected the rebound and immediately called timeout. From there, Beilein knew where he was going. Michigan had one of its worst shooting days of the season on Saturday. Abdur-Rahkman missed all six 3-pointers he attempted. The Wolverines were 7 of 29 from deep before Poole's shot. At one point during the second half, U-M bricked three open looks in a single possession. All things pointed toward Michigan's number being up. "We ain't done yet," Matthews shouted into his phone with his brother at the other end. "You're only as good as your last game and our last shot went in. "I'm lit, man. I've got nothing to say." The victory puts the Wolverines in the Sweet 16 for a second straight year and for the fourth time in the last six. Beilein has now tied Steve Fisher for all-time Sweet 16 appearance at U-M with four. On top of that, this Michigan team became just the fourth in program history to record 30 wins in a season: Joining the 1989 national title team, the 1993 Final Four team and the 2013 national runner-up team. And with that, Michigan will pack its bags for Los Angeles. But not before a bit of work, as Poole told reporters he still has a Greek mythology paper due in Ann Arbor on Monday. The life of a heroic student-athlete, who now lives in Michigan mythology. "I was thirsty (out there), definitely thirsty," Poole said. "I always felt like I'd be in a situation like that at the end of a game. My teammates tell me I've got ice in my game. I was definitely thirsty. "And I just knocked the shot down." 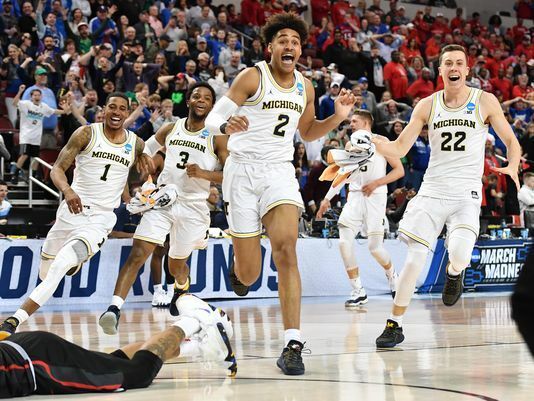 0 Response to "Jordan Poole plays hero as Michigan basketball advances to Sweet 16"